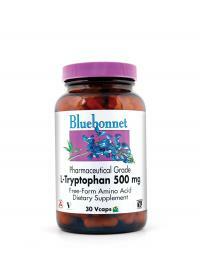 Bluebonnet’s Pharmaceutical-Grade L-Tryptophan 500 mg Vcaps provide a highly pure, vegetarian source of free-form L-tryptophan called TryptoPure™ from Ajinomoto, the global leader in the production of pure, pharmaceutical- grade free-form amino acids in easy-to-swallow vegetable capsules for maximum assimilation and absorption. AjiPure® and TryptoPure® are registered trademarks of Ajinomoto AminoScience LLC. CAUTION: Do not use this product, if you are pregnant, trying to conceive, breastfeeding or taking a prescription antidepressant. Consult your healthcare practitioner before use if you have a medical condition or if you are taking any prescription medications.